Though you may not be aware of it, whenever you’re playing in any of Disney’s many theme parks, the Imagineers who designed those parks are busy playing with your head. EVERY GUEST IS A HERO reveals for the first time how the artists and technical wizards of Walt Disney Imagineering have harnessed the magic of mythic storytelling to press all sorts of psychological buttons you never knew you had, inspiring you and millions of your fellow visitors to return to the parks again and again. 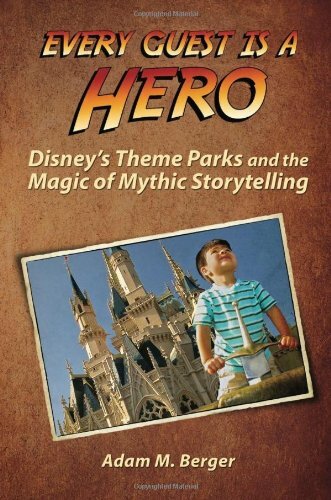 Longtime theme park designer and attraction show writer Adam M. Berger is your tour guide, decoding the mythic themes and archetypes of the Disney parks in an entertaining, engaging, and always accessible manner. You’ll discover page after page of “ah-ha!” moments as you encounter one surprising connection after another. You’ll also find a collection of ten “Mything in Action” case studies that break down the mythic content of some of your favorite Disney attractions, scene-by-scene. There’s even a chapter devoted to the mythic realms of George Lucas, offering tantalizing clues about some of the amazing experiences now being Imagineered for Disney’s forthcoming Star Wars-themed lands. It’s a must-read volume for Disney enthusiasts and aspiring Imagineers alike. So strap yourself in, keep your arms and legs inside at all times, and prepare to embark on a voyage of mythic proportions. Once you’ve read EVERY GUEST IS A HERO, you’ll never look at your favorite Disney attractions the same way again.